Picture Book Party: George Ezra will be singing the original theme song for Channel 4’s We’re Going on a Bear Hunt! George Ezra will be singing the original theme song for Channel 4’s We’re Going on a Bear Hunt! This Christmas, Channel 4 are going to air a special animated adaptation of We’re Going on a Bear Hunt! 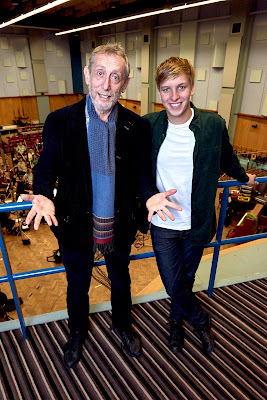 And it has just been announced that acclaimed British singer-songwriter George Ezra has written and recorded the theme song. The 23-year-old, whose debut album Wanted On Voyage was one of the UK’s best-selling of 2014, has penned a distinctive, sweet song called Me & You for the film’s soundtrack. Me & You marks the first time that George has composed a bespoke song for film or television. The original score for We’re Going On A Bear Hunt is composed and conducted by the multi-award-winning Stuart Hancock (Atlantis, Crazyhead) and was recorded at Abbey Road Studios with City of London Sinfonia. The 53-piece ensemble was joined by 50 young singers from the London Youth Choir. This Christmas, Channel 4’s half hour film will expand the universe of the much-loved book for a truly festive family treat. Olivia Colman (Broadchurch, The Night Manager), Pam Ferris (Matilda, Call the Midwife) and Mark Williams (Harry Potter, Father Brown) will breathe life into the brand new characters of Mum, Grandma and Dad respectively. Michael Rosen, who wrote the best-selling book, will play the Bear. Based on the hit bedtime book written by Michael Rosen and illustrated by Helen Oxenbury and produced by the makers of Channel 4’s hugely-popular The Snowman and The Snowdog animation, We’re Going on a Bear Hunt follows the intrepid adventures of siblings Stan, Katie, Rosie, Max, the baby and Rufus the dog, who decide one day to go on an adventure in search of bears. Made with exquisite, hand-drawn animation, the film is set to enchant a whole new audience with its story of perseverance, optimism and a love of nature. The official We’re Going On A Bear Hunt soundtrack featuring George Ezra’s Me & You will be available from Friday, 23rd December .